Should've been 1080p on a 5.5" screen. I am looking to buy a mid-range smartphone and have narrowed my search down to two devices - namely Lumia 830 and Desire 820. Can someone please tell me, which, between these two, is the overall better device? 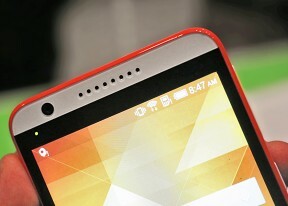 What is the size of the sensor of the Desire 820? Which of the two devices records sharper and crisper videos with the rear camera? Lumia 830 or Desire 820? What about the rear-camera performance of this device in low-light. Which is having better processor? Nexus 5 or htc 820? Contacted htc support and they told that this device will be available on November(Specific date is not available though) and the price is around 26k to 28k. is htc 820 can play full hd videos? what about the battery ? in the next five years Mobile devices will outnumber everything on the earth ! what's the expected price of this phone? 720p on a 5.5 inch display with a spanking new 64-bit 615 Soc??! Yikes! Wake me up when the 4.7 inch version comes out. What do you mean by mid-range???? in what range does it fit in ???? My god that glossy plastic, back and front, hideous. What are the non-huge modern phones from HTC?